That’s right, after thousands of votes, we have a winner. Congratulations to the Percy Jackson series! 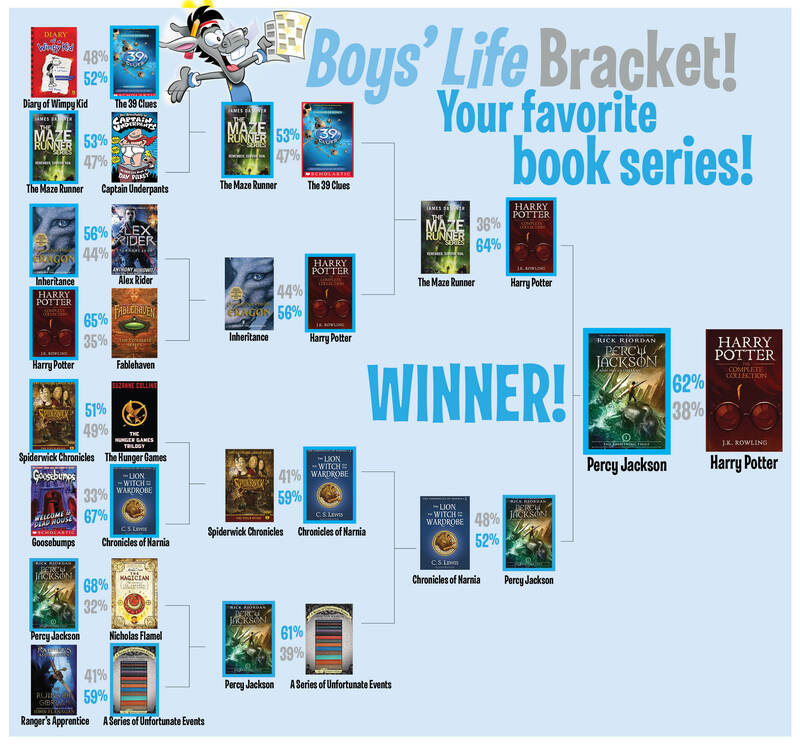 Rick Riordan’s epic saga bested Harry Potter int he final round of voting. How did your favorite book series do? Sound off in the comments section below. This entry was posted in Giveaways, News & Reviews and tagged spotlight on April 12, 2016 by Clay Swartz. Man, I wish the Maze Runner won! Best book ever!!!!! I wish that Harry Potter won, but I like Percy Jackson too. How did percy Jaxon win over Hary potter?!! The lord of the rings should have one!!! well, the lord of the rings should have one!!! Harry potter is better than percy jackson. why did so many people put percy jackson? it’s not even that good. this contest was rigged and i want a revote. Ranger’s Apprentice is way better than a lot of these books. In fact, I think it should have won. harry potter 4 da win!! A Series Of Unfortunate Series should’ve won!! I wish that Narnia had won. Hunger Games should have won!!!!!!!!!!!!!!!!!!! I am glad harry potter won. No, not no offense. Take tons of offense. Harry Potter is wayyyyy better than Percy Jackson. I completely agree. The hero’s of Olympus series is pretty great too! I have a feeling this is going to be Harry Potter vs. Narnia. why can u not do semifinals and stuff like that?